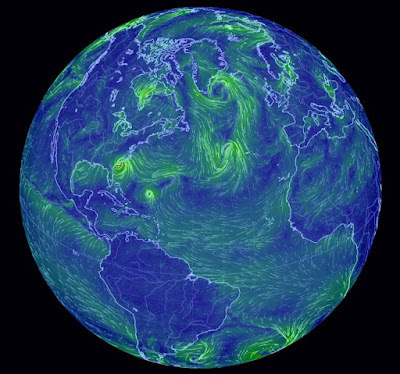 earth ~ a global map of wind, weather, and ocean conditions! "A visualization of global weather conditions forecast by supercomputers updated every three hours. Ocean surface current estimates updated every five days. Ocean surface temperatures and anomaly from daily average (1981-2011) updated daily. Ocean waves updated every three hours." Oola Sportswear ~ Active Garb That Covers! Ventusky ~ Remapping Wind Rain and Temps!